Comprehensive and up-to-date guidance and practical advice for the constantly changing area of landlord-tenant law. Print Book 834 pages in 1 volume (printed book) with downloadable forms Note: For print books, with MCLE's supplementation service, new supplements and revisions are mailed automatically with an invoice. If you do not want to subscribe, please check the opt out option during checkout. Landlord and tenant law in Massachusetts comprises a myriad of statutes, regulations, and common law provisions. This book guides you through each stage of the landlord-tenant relationship, from the creation of a tenancy to its termination and posttermination issues, providing sample documents and pleadings for guidance. Featured are judicial and ethics commentary as well as tips for effective practice. The manual is full of the information you need to understand the complexities of real estate lease agreements and to represent both lessors and lessees in residential and commercial relationships. 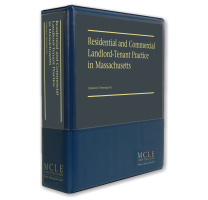 Thank you for updating your reference library with the 2018 supplement of Residential and Commercial Landlord-Tenant Practice in Massachusetts. This supplement brings the latest in landlord-tenant law and procedure within your immediate reach—for fast answers to the questions that arise most frequently in your practice. a newly added discussion of writs of entry (actions to recover possession of real property when the superior titleholder has been dispossessed), including a sample complaint. The 2018 supplement also includes new and updated forms, newly reviewed judicial and ethics commentary, and updated practical guidance for representing landlords and tenants. With this latest supplement, Residential and Commercial Landlord-Tenant Practice in Massachusetts remains an essential companion for any lawyer handling a landlord-tenant matter in Massachusetts. We at MCLE thank you for your ongoing support of this product, as we continue our efforts to bring you the latest solutions to the issues you face in your practice. Thank you for updating your reference library with the 2016 edition of Residential and Commercial Landlord-Tenant Practice in Massachusetts. This edition brings the latest in landlord-tenant law and procedure within your immediate reach—for fast answers to the questions that arise most frequently in your practice. numerous recent decisions from the Housing Court on the termination of residential leases. With this latest edition, Residential and Commercial Landlord-Tenant Practice in Massachusetts remains an essential companion for any lawyer handling a landlord-tenant matter in Massachusetts.